Breastfeeding is one of the most incredible gifts a mother can give to her child. Our breast milk is the life source for our little ones, and we want to make sure it's filled with all of the nutrients they need. A common concern about breast feeding is that there's not enough fat in breastmilk. In this article, we'll discuss how to increase fat in breast milk. If you think that you don't have enough fat in your ​breast milk (see our complete breast milk guide here), don't fret. This is a very common concern for new mothers. The good news is that there's several things you can try to increase fat in breast milk. We'll discuss the primary factors below that affect the fat content in your breastmilk as well as how to make breastmilk more fatty. The best indicator of a possible issue in fat content in your breastmilk is if your baby is not gaining enough weight. However, another possible cause of your baby not gaining weight is an aversion to eating (learn more). Let's discuss each of the factors that are critical when increasing fat in breast milk. These include time of day, duration of feedings, frequency of feedings, as well as diet. If you're experiencing not enough fat in breast milk, make sure you're following best practices which we discuss below! The time of day significantly changes the amount of fat in the breast milk. This differs from mother to mother. So take a look at your daily feeding sessions and write your thoughts down in a journal. Do your breasts seem to be fuller in the morning, afternoon, or evening? Take a look at your notes after a week’s time. See if any patterns in the fullness of your breasts occur. Note the time it occurs, and you can make changes accordingly. Veteran Mommy Tip: If your breasts are fuller when baby is sleeping, try pumping and storing your breast milk. This way your baby can get all of that yummy goodness! 2. How Much Time has Gone by During the Feeding? The fat content in the milk depends on how empty or full the breasts are. An empty breast has higher fat content. A full breast has much lower fat in the breast milk. Sounds strange, right? It's important to look at the time that has elapsed since the start of the feeding. The foremilk, milk at the beginning of a feeding session, is full of water, protein, and other nutrients, but has less fat content. The hind milk, milk toward the end of the feeding session, has very high fat content. Veteran Mommy Tip: If you think your baby is not getting enough fat in their milk, pumping could fix the problem. For example, you can pump one-third of your milk to extract the foremilk. Then begin breastfeeding. This allows your baby to receive the hind milk first. Depending on how hungry they are, you can then bottle feed the foremilk. Another tip is to simply increase the duration of feedings so that your baby gets more hind milk. If you don't have an electric breast pump, an inexpensive way to test this method and see if it works for you is to try a manual breast pump. If you don't have a manual pump, check out the super popular Silicone Manual Pump by NatureBond. It has incredible reviews and is very inexpensive. Another counter-intuitive fact about breastmilk is that the more frequent the feedings, the higher amount of fat in the milk. This is because you are not giving your breasts enough time to fill up. Try feeding your little one for shorter amounts of time, but feed him more often. You can also try breastfeeding on demand. As soon as you feel your breasts beginning to fill, feed your little one. And give them the time they need to fill themselves up. Your diet does not affect the amount of fat in your breast milk. However, it does affect the types of fat that is passed on to your little one. If you're concerned that you're not getting the right nutrition that you need to have healthy breastmilk, don't fret! There are lots of great lactation supplements and snacks that can help you get exactly what you need in your diet! We'll discuss some of the most popular products below. One delicious option to check out are Boobie Bars that come in lots of yummy flavors. Boobie Bars help you maintain a healthy milk supply. In addition, they're individually wrapped, so they're great for moms on the go! Your child needs the right types of fat, as the fat they receive is used to metabolize vitamins. When they do not have enough vitamins in their body, a vitamin deficiency can occur. 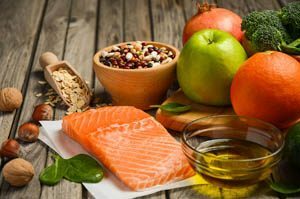 It is very important to make sure that you are eating healthy types of fat. These fatty acids improve your infant’s growth and development. They help boost the development in your baby’s brain and retinas. They are also linked to improving the immune system. You can find Omega 3 in walnuts, soybeans, flaxseed, and fatty fish. The recommended weekly dose is two to three servings of Omega 3 in your diet. Don’t like fish or want a yummy treat while still getting healthy fats and vitamins? Try making some delicious Oatmeal Chocolate Chip Cookies that are made to boost your breast milk supply. They are yummy, healthy cookies that are also a lactation supplement! It's easy to see why they're extremely popular! Omega 6 helps with growth and brain development. They can be found in vegetable oils and seeds. Making a trail mix is a great way to add some Omega 6 to your diet. To do this, take some walnuts, Brazil nuts, peanuts, sunflower seeds, and any other nuts and mix it with your favorite trail mix ingredients. If it's around Halloween, you can also roast some pumpkin seeds and mix them in. It's fun and yummy at the same time! Or if you love pumpkin seeds as much as I do, you can get some yummy varieties like these Toasted Onion & Garlic Pumpkin Seeds by Gerbs any time of the year. The reviews for these pumpkin seeds are incredible! Once you taste them, it's obvious why. I also love the Maple Sugar & Sea Salt Pumpkin Seeds by SuperSeedz. They seem like a new company (or are new to me), but their offerings are delicious! I recommend checking them out if you love pumpkin seeds. I prefer their pumpkin seeds over Gerbs, but Gerbs are a lot more popular right now. These fats help lower cholesterol and lower the risk for heart disease. They also help improve blood sugar control. Monounsaturated fats can be found in olive, peanut and canola oils. Other great sources include almonds, poultry, avocados, nuts, and seeds. If you're looking for a great snack on the go, check out the individually wrapped KIND Caramel Almond & Sea Salt Bars! They're a great way to get monosaturated fats through a yummy almond snack. Make sure you are limiting the amount of saturated fats in your diet. Saturated fats can be found in fatty meats and dairy. If you are not producing enough fat in your breast milk, increase your protein intake. Protein is in fatty fish, such as salmon, herring, and anchovies. Make sure you stay away from tuna, mackerel, shark, and swordfish. These fish can have high traces of mercury. Protein can also be found in yogurt, cheese, eggs, beans, and nuts. Breastfeeding can be a time of frustration and self-doubt. Keep in mind that every mom feels discouraged at some point. Above, we discussed some methods on how to make breastmilk fattier. Breastfeeding takes getting used to. Every baby is different and every mom is different. So find out what works for the both of you. There are plenty of techniques and remedies to try. Just remain calm, breathe, and know that you are doing the best thing for your little one. You are providing the best source of food they can possibly get.